Manchester United returned to Europa league action on Thursday after they played play a one all draw with Swansea City on Sunday. Marcus Rashford produced some display of brilliance as he scored a spectacular free kick which proved to be decisive, giving Manchester United a first leg victory over Celta Vigo at the Balaídos stadium. appeared he dived to earn Manchester United a Penalty that was converted by Wayne Rooney. But the England International was unfazed by the criticism as he produced a world class display on Thursday night Manchester United, having lost the likes of Zlatan Ibrahimovic, Luke Shaw, Eric Bailly to injuries welcomed back Chris Smalling, Phil Jones and Paul Pogba to the squad. Manchester United had really good chances in the first half with Jesse Lingard getting into good chances in the first half but failing to beat Sergio Alvarez, Rashford tested the keeper with a good effort while Henrikh Mkhitaryan missed the best chance of the half after a great pass from Paul Pogba. Manchester United finally got their chance on the 67th minute when a Marcus Rashford free kick found the back of the net. Marcus Rashford was later withdrawn from the game following what looked to be an injury but, the manager after the match had this to say: "He started the game with a little problem, and obviously with the running and continuity he was feeling and Martial was fresh and he had to give us the last 10 or 15 minutes where we thought we could still score because of plenty of space to play. 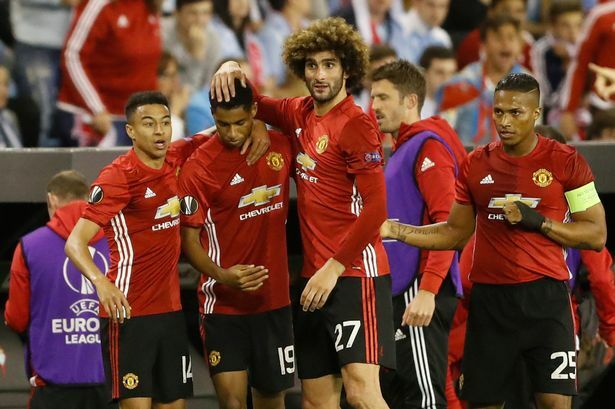 The victory gives Manchester United an edge that will see Celta Vigo score atleast 2 goals at Old Trafford if they are to have a chance of making it to the final with the second leg tie scheduled for 11th may 2017.